The Dreamcast Junkyard: Will a Dreamcast Lightgun Work on a Sega Game Gear Screen? 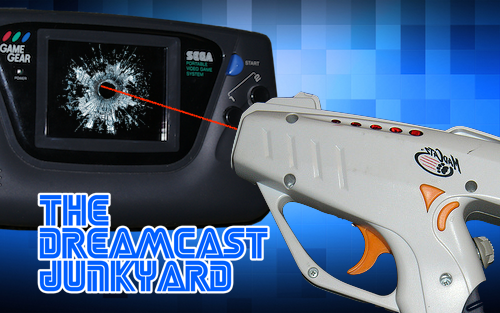 Will a Dreamcast Lightgun Work on a Sega Game Gear Screen? It was a very important question. So I put it to the test. How is that even possible? I know how you got it to work via the TV tuner but that is just too awesome! I thought only 1 arcade gun could work with LCD screens and that would be with Mame or the Xbox original? So there must be some secret to getting it to register on screens other than CRT's? It's actually similar to using the Madcats lightgun on a regular LCD or flatscreen CRT TV. There is a wide shake to the aim and it randomly reads the gun on and off screen. It's possible to aim the gun a bit nearer to the center of the screen but the game is not really playable like this. Sorry. It's just a fun video and LCDs will never work properly with Dreamcast Hardware. Get a CRT monitor before they all get recycled. I know that some people have had luck finding CRT TVs that work with the Dreamcast but I haven't found any of them in the wild. Every flatscreen CRT TV I got (From garage sales and free on the side of the road) didn't work with the Dreamcast Lightgun (or rather worked as well as the Game Gear did). However flatscreen CRT monitors generally always work with it using a VGA adapter.